Loose-fitting top or dress has front tucks, back button loop closure and stitched hems. A, B: short sleeves with elastic. C, D: sleeveless. A, D: purchased trim. D: appliques. Straight-legged pants or shorts has elastic waist, side seam pockets and stitched hems. 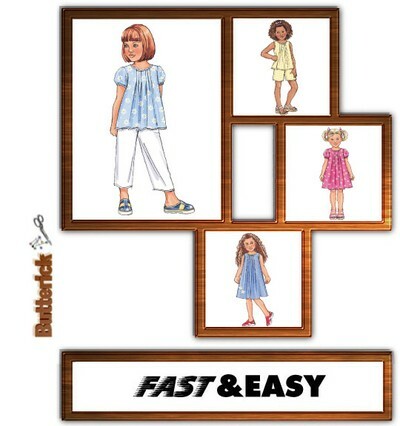 Notions: Top A, C, Dress B, D: Three 1/2" Buttons and 1/2" Single Fold Bias Tape. Also for A, B: 7/8yd. of 1/4" Elastic. For A, D: Approximately 3/8" Edging: 21/8yds. for A and 13/4yds. (1.6m) for D. Also for D: Purchased Appliques as Desired. Shorts E, Pants F: 3/4yd. of 3/4" Elastic.